The Very Best Christmas Episodes Ridiculous and Great Fan Theories Jokes You Need a PhD to Understand Unbelievable Fan Art Opening Captions in Every Episode Greatest Episodes Great Gifts for Futurama Fans Inspired Tattoos Favorite Characters Risqué Jokes You Totally Missed Predictions That Came True Funniest Robots Every Season, Ranked Times Bender Was the Greatest Need to Quote Someone? Why Not Zoidberg? List Rules Vote up the saddest 'Futurama' episodes that made you feel all the feels. For a show that's supposed to be funny, Futurama sure does have some sad moments. In fact, it's hard to think of any animated show that has ever been as emotional as Futurama, even if you stack it side-by-side with The Simpsons. Hell, the saddest Futurama episodes are probably more likely to make you cry than almost any other show on television, animated or not. We all know "Jurassic Bark" is super sad, and everyone loves Seymour the dog, but there are at least eight other really sad episodes of Futurama just as likely to make you cry. Take "Game of Tones" for example, in which Fry finally reconciles with the loss of his family. Other episodes, like "Leela's Homeworld," give a lot of backstory to characters and really drive their development in the series forward. Which sad episode of Futurama made you cry like a baby? Vote up the emotional Futurama episodes below that you enjoyed the most. You knew this would be here. "Jurassic Bark" isn't just one of the saddest episodes of Futurama, it's one of the saddest episodes in the history of television. Like most of the episodes on this list, "Jurassic Bark" contains numerous flashbacks to what Fry's life was like in the 20th century. You already know how this one goes, but let's break it down anyway. Upon visiting a museum and seeing a fossilized dog exhibit, Fry realizes that the dog he's looking at is his dog from the 20th century, Seymour. After obtaining the dogs fossilized body, Professor Farnsworth tells Fry he can get a DNA sample from the dog and clone him, with Seymour's personality and memories in tact. As the cloning process is about to begin, the computer tells the Professor something different from what he initially thought - Seymour died at age 15, meaning he lived for 13 more years after Fry went to the future. Upon hearing this, Fry decides to abort the cloning process, thinking Seymour lived a full and happy life with another owner. Then the final scene happens. We get to see how Seymour actually lived out his final years; waiting for Fry day and night outside of Panucci's Pizza. As the seasons pass and the world changes around him, Seymour continues to wait for Fry, until the final shot, when he lays down and closes his eyes for the last time. The song playing during this scene is "I Will Wait For You" by Connie Francis, and it is a damn sad song given the context. Did this make you sad? 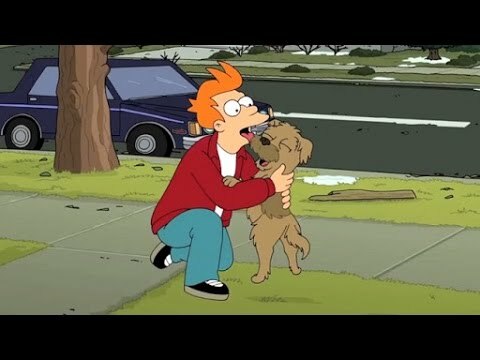 Arguably the most profound episode of Futurama in the series, "The Luck of the Fryish" gives viewers insight into Fry's childhood, particularly his relationship with his older brother, Yancy. Told through a mix of flashback and present-day narrative, the episode reveals that Fry had a lucky seven-leaf clover as a kid, which allowed him to beat Yancy in any competition. After having rotten luck at the horse track in the present, Fry realizes that the clover should still be at his old house. The gang goes to Fry's childhood home to find it, and when it's not in its hiding place, Fry concludes that Yancy must have stolen it. On their way back to Planet Express, the gang discovers a statue built in Yancy's memory. There is a seven leaf clover on statue Yancy's lapel, and an insignia that reads, "Philip J. Fry - The Original Martian." Furious, Fry believes Yancy not only stole his clover all those year ago, but his name and dreams, as well. The Professor shows Fry a historical video about billionaire astronaut Phillip J. Fry, and it is revealed that Yancy's body is buried in a nearby cemetery. Fry decides to visit the grave site and dig up the clover, which is when things gets really sad. A flashback shows Yancy, his wife, and their newborn son, whom Yancy names after this brother. Yancy gives his son the seven-leaf clover, expressing how much he misses Fry. 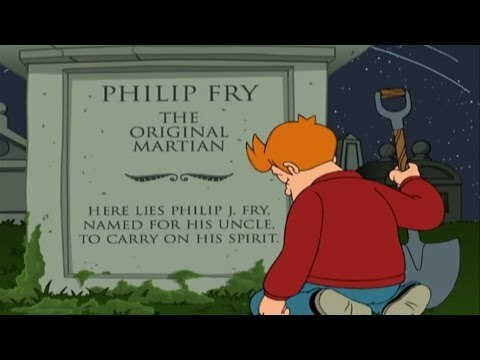 Cut to present day, and Fry reads the an inscription on the grave that he didn't see before - "Here Lies Philip J. Fry, named for his uncle, to carry on his spirit." Yancy didn't steal Fry's life, he named his son after him because he missed him so much. Another flashback episode, "Game of Tones" takes us inside of Fry's dreams. In the episode, a mysterious spaceship slowly approaches earth, broadcasting a four-note tone only Fry seems to recognize (although only vaguely.) The Professor scans Fry's brain and reveals that his memory of the tone comes from December 31, 1999, the night Fry fell into the cryogenic machine and accidentally froze himself for 1,000 years. The Professor connects Fry to some kind of dream machine, through which Fry can enter his old dreams while the crew watches on a monitor and communicates with him. Fry explores his old neighborhood before accidentally waking up, only to discover that two weeks have passed since he went into the dream machine. Upset, Fry tells the crew he doesn't want to go back, as there's nothing for him in the past. However, upon going back and seeing his old dog Seymour, Fry thinks about his relationship with his family, particularly with his football-obsessed mother. He realizes he needs closure, and instead of trying to find out what's causing the alien notes, he savors time with his family in this dream state. A lot happens after that, so to sum it up quickly - the alien notes were coming from one of Nibbler's friends, who lost his keys and was trying to locate his old ship. Fry saves the day, and Nibbler promises him he'll return the favor. 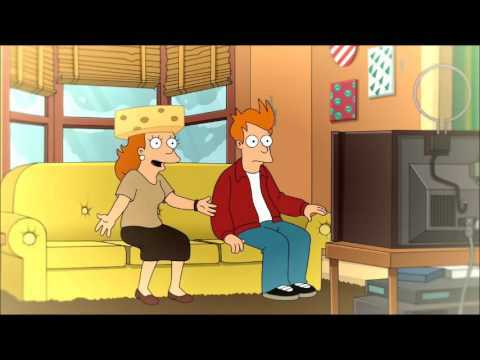 That night, Fry goes to sleep, and in his dreams finds himself sitting next to his mother on the couch watching football. After hearing the final score from the 2000 Rose Bowl, Fry becomes confused as to how he could remember something in such detail if he was already frozen when it took place. Nibbler appears, and tells Fry he is in his mother's dream, not his own, and that this is the favor Nibbler promised. Fry and his mother embrace, and she tells him she dreams about him all the time since he left. Cut to Fry's mother waking up from her dream in the past, looking at a picture of Fry and smiling. This final scene is painfully sad, and is almost comparable to "Jurassic Bark" in terms of how hard it hits you. Leela and Fry deliver a package to Luna Park, the site of their first delivery together. After Leela almost dies in a freak accident, Fry decide to propose to her. Using the Professor's new invention, a machine that causes the entire universe to jump back 10 seconds at a time (and includes a shelter to shield you from those effects), Fry steal diamonds for an engagement ring. He then invites Leela to meet him at the top of the Vampire State Building at 6:30, but only if her answer to the engagement is yes. Fry waits until 7:02, then decides to jump off the building. However, on his way down, Fry discovers Leela did come, and that his watch was affected by the time skips, meaning it tells the wrong time. Having jumped off the building more than 10 seconds ago, and taking into account that the device takes 10 seconds to charge between uses, Fry realizes he can't use the Professor's new invention to save himself, only continuously stall the inevitable. Professor Farnsworth realizes time is looping repeatedly, and warns the crew that the universe could be damaged if this continues. He advises the crew to get under the shield he built to prevent the effects of the button, and they make their way to the Vampire State Building, where they find Fry using the button. By this time, hours have passed, and Fry is tired. He accidentally lets go of the button and splats on the ground. Leela grabs the device and brings him back to the seconds before impact. The Professor is seemingly vaporized after stepping outside the shield to help, but Bender hatches a plan to save Fry using an airbag. The plan works, but Fry lands on the button, crushing it and freezing time throughout the universe except for him and Leela. The two spend decades in the world alone, taking romantic walks with the universe as their playground. Occasionally they see an odd glimmer of light, but make nothing of it. Eventually they decide to have champagne on top of the Vampire State Building, where the incident took place all those years ago, when suddenly the glimmer of light reveals itself as the Professor, who tells them he has been searching for the button for decades. With one modification he can send them back to where they were before it all started, and despite having grown old together as lovers, Fry and Leela decide to "go around again." The Professor presses the button, and Futurama officially ends.